Although I have always dreamt of riding a bike around the countryside since I was a child, I had never taken it any further until just over a year ago when my son & I did a weekend ride on the Darling Downs. This inspired me to do some research on bike touring via the internet. After considerable research I decided to take the plunge and ordered the necessary equipment to kit out the bike (racks, panniers & etc). The only changes I have made to the bike since new has been a change of wheels, crankset and seat. The wheels are now Velocity Dyad with sealed bearing hubs. Both front and back are 32 spoke. The crankset is now Shimano Alivio with 22 32 44 tooth sprokets. The seat is a Brooks Flyer Special. The bike, with rider, now looks like this. The 5 day Downs trip identified several areas for change/improvement. The major problem I encountered was the uncomfortable seat. It was so uncomfortable that I was looking forward to the end of each days ride within a short time of starting the days ride. It did not matter how I sat on the seat, there was not a position that I found comfortable. The limiting factor of how far I could ride each day was not my fitness or legs tiring or any other physical problem but was purely the uncomfortable seat. The trip was planned for 5 days of around 60 to 70 km per day, however now that I have completed a trip I believe I can push that out further to perhaps 80 to 100 km if required. In December 2011 I purchased a Brooks Flyer Special leather seat to replace the plastic one. These seats need to be 'run in'. This is accomplished by using leather wax dressing and about 800 kilometres of use. Although most people report that at first these seats are very uncomfortable, I found mine to be little different to the plastic one. I have only ridden it about 300 kilometres so far and still find it uncomfortabe but no worse than the one it replaced. A kick stand to hold the bike up when there is nothing around to lean it against. Some form of strap to wrap around the brake lever to stop the bike rolling away when parked. Having a handle bar bag upsets the balance of the bike and it has a habit of turning the front wheel particuarly when on sloping ground. On my December 2011 trip I used a toe strap taken from an old pedal. I used this on the rear brake lever everytime I parked the bike. This has proved extremely successful. The bike is rock solid when against any item that can support the weight of the bike against it. I also use it when travelling in trains. 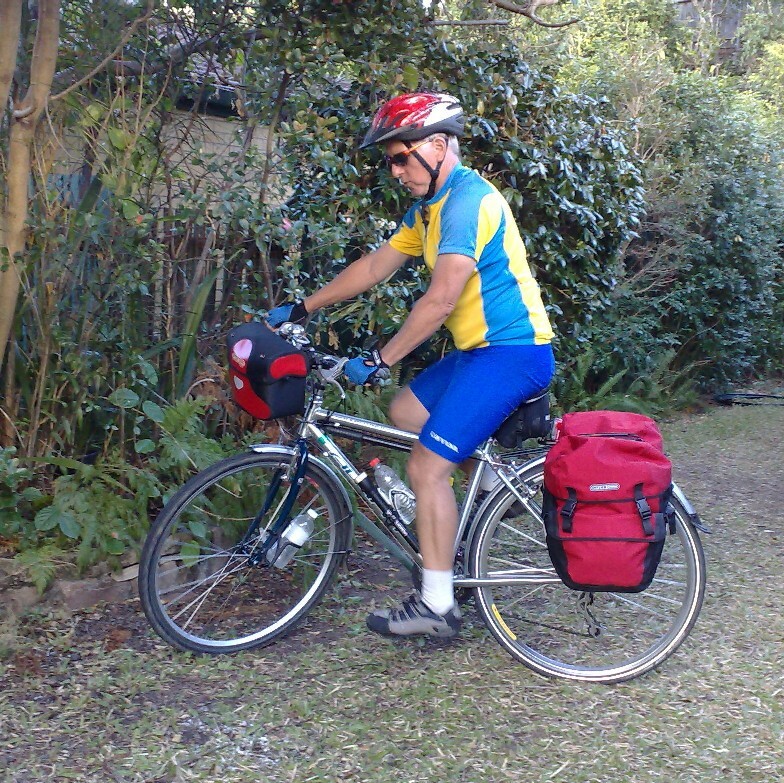 I no longer remove the panniers but rather just lean the bike against something and apply the brake. The trains acceleration and braking do not cause the bike to move around. On any future trips where I plan to travel for more than 5 days I would include a rest day after every 4 days of riding just to give the body time to recover. Please contact me for any information or questions you may have. I gladly accept e-mails from other riders who have any information or advice for me.